Parkland Activists Feature On TIME Magazine Cover - Joe.My.God. 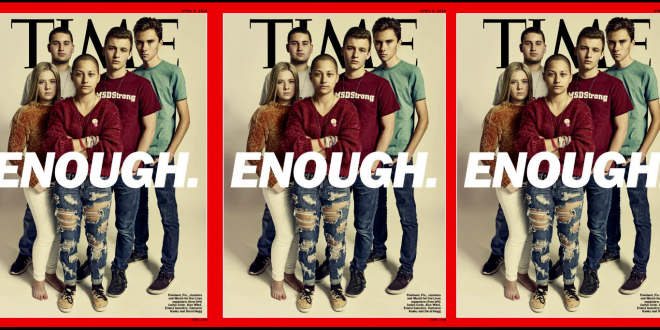 Parkland students from Marjory Stoneman Douglas High School made the cover of the next issue of TIME magazine. Standing above the headline “ENOUGH’’ in the April 2 issue are Jaclyn Corin, Alex Wind, Emma Gonzalez, Cameron Kasky and David Hogg. The story, titled “The School Shooting Generation Has Had Enough,” captures snapshots of the students’ everyday lives since the Feb. 14 shooting that killed 17 classmates and faculty members. The article shows them in quiet moments in their Parkland homes and meeting and bantering at their #NeverAgain movement office headquarters in Coral Springs where they’ve been organizing Saturday’s “March For Our Lives’’ rally in Washington D.C.
How a movement catches fire is always a mystery, but the Parkland kids seem matched for this moment. They’re young enough to be victimized by a school shooting, but old enough to shape the aftermath. Like many teenagers, they’re at a peculiar stage in their lives where they feel at once vulnerable and invincible, highly social yet impervious to the etiquette expected from adults. Their bombastic style mirrors President Trump’s: they call their enemies names and hurl sick burns at politicians and lobbyists as if they’re shouting across the locker room. The first big test will come on March 24 with the student-led March for Our Lives, which already has registered more than 800 demonstrations in all 50 states and on six continents. The organizers plan to allow only young speakers to address the Washington march, and only artists under 24 can submit official poster designs. The march is meant to expand voter registration among like-minded members of the school-shooting generation: the kids that grew up post-Columbine, who huddled behind barricades during active-shooter drills and learned to tape construction paper over classroom windows.